Is it really necessary to get a workplace or a studio for drawing? Of course it is! Getting a place set up for your drawing comfort is just as important as the getting your drawing materials ready before you start drawing. Surely some prefer to draw outdoors or in coffee shops,but some of these places are not accessible all the time. Having a workplace( or some refer to as a “mini studio”) allows you to relax, draw and experiment with your favorite comic artist works all at the comfort of your home. There is a lot of factors that contribute to you being at your best while you draw. For example; having a comfortable chair can help you avoid putting strain on your back and allows you to relax while you draw or having the proper lighting is essential to avoid stressing out your eyes.Setting up a studio or a workplace doesn’t mean you need to have a large space or rent out an office or a shop lot.It can be as small as your storeroom or a section of your bedroom.You only need a space just enough for a table, a chair as well as a side table(note that this setup does not include the usage of computer and scanner for scanning ). Here are some of the thing that you may want to understand before setting up your very own workplace or “mini studio”. Almost every comic artist has their own drawing space and each one has his or her own preferences. But in order to find just the right environment, one need to experiment in different type of places. For example; try taking your sketchbook to a library to draw.Are you comfortable with the quiet and calm atmosphere around you or you just cannot get yourself to concentrate when thing are “too silent”? If the latter is the case, try a coffee shop next and see if the environment fits you. If it does , the other things that you must take into account is the space that the place have.Do you have a place to put your materials? – Is the coffee that you ordered limiting your drawing space? – Is there a chance that the coffee might spill and affect your whole workplace? – Maybe having a side table might help with either the coffee or your drawing materials? The idea is to find out what is needed to have a workplace that can mimic the same atmosphere you want (example: coffee shop) but at the same time making the necessary adjustment and adding up the required equipment that you probably cannot have in a coffee shop (example: side table). Although this does not entirely affect the set up of your workplace or mini studio, it goes to show how often you access workplace and how long will you be spending your time when you are in your workplace to draw. When some like to spend like to spend one or two hours at a time and occasionally comes back later to spend a couple more hours to draw, others may prefer to spend three to several hours at one time. Often doing sketches and finishing up their drawing before calling it a day. If you are one to spend straight hours a day rather than taking breaks in between, be sure to proper ventilation for your workplace as not having the place aired-out or ventilated enough can make you tire and stressed out easily at the same time affecting your mood to draw altogether. The other factor to consider is how well or efficient you draw during the specific time of the day. Are you focused and more productive in the morning or are you a lot more hyped-up in the afternoon? If you function better in the evening for example, then you should organize your schedule so that you do most of your drawing later in the day. Having proper lighting is crucial when you are drawing.You can always depend on the light from your room but having an additional table lamp or a clip-on lamp can really help.When you are drawing, try to avoid working under dimly lit conditions as it can result to being harmful and can stress out your eyes. To assume all tables are suitable for drawing is a mistake commonly made by beginners. Most flat surface tables are fine if you are drawing for a short period of time.But if you like to spend several hours drawing, flat surface tables can put pressure to your back making you tire easily.Drawing this way also makes your illustration look distorted. Drawing at an angle helps keep your posture allowing you to be more productive, focused and more comfortable at the same time eliminating any strain on your back. A drafting table is by far the best option, but not everyone has them and drafting tables can be a bit “pricey”. 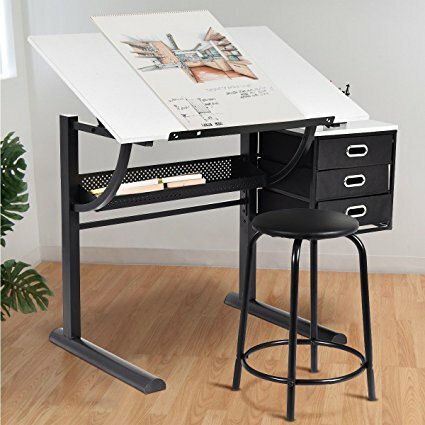 If you do not have the budget to buy a drafting table just yet, you can always find cheaper adjustable tables as substitute. Try to avoid drawing on flat surface and at best, try to get a regular board or large clipboard and position it at about a 45o angle to avoid distortion in your artwork.